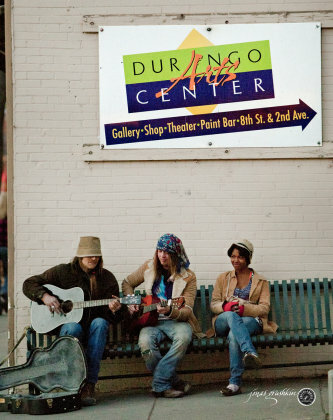 The Durango Arts Center (DAC) provides Durango and surrounding communities opportunities to create, to promote, and to participate in diverse arts experiences. The DAC brings people together to explore and engage in arts and culture by fostering creative expression through in-house exhibitions, performances, and educational programs for all ages and abilities. The DAC strives to support a creative dialogue among community members, ensuring that culture informs local decision-making and enriches our lives. At the Durango Arts Center, you can enjoy the visual arts, theater, dance, live music, education programs for children and adults, and many other activities for all ages. Located in downtown Durango, CO, the DAC has become the hub for cultural innovation in southwest Colorado. The building housing DAC, at the corner of E. 2nd Ave. and 8th St., was once home to a car dealership. In 1997, the community collaborated to fund and renovate the 17,000-square-foot building, now home to a gallery, theater, arts library, studio space and more. Come play and explore! DAC is a nonprofit arts organization providing Durango and surrounding communities opportunities to create, to promote and to participate in diverse arts experiences through in-house educational art programs, exhibits and performing art. DAC is supported largely through memberships and donations and offers a variety of volunteer opportunities. DAC offers year-round education programs in the visual and performing arts, featuring classes, family art camps, Saturday workshops and open studios for teens, adults and children as young as two years of age. Whether engaging with professional artists in the DAC Education Studio or reaching out to local schools to strengthen arts in the classroom, DAC aspires to cultivate creativity in learners of all ages and abilities. DAC Theater strives to offer entertaining, professional and quality theater to Durango and surrounding communities. We aim to excite our audiences with old favorites and challenge them with new and non-traditional works. DAC hosts year-round exhibits in the Barbara Conrad Gallery featuring local, national and internationally recognized artists. Supporting a practice of diversifying the visitor’s experience, each DAC exhibit includes special events such as lectures, artist demonstrations and film screenings. Upstairs you will find the Art Library, sponsored by Friends of the Art Library (FOAL), that hosts six exhibits each year featuring local and national artists all diverse mediums. DAC offers an on-line members Artists’ Directory and On-line Exhibits featuring local and national artists. Artists can become DAC members from anywhere! This non-profit listing is proudly sponsored by The Rochester Hotel, providing visitors with a cozy, convenient place to stay with home-cooked breakfast every day.